Reading this post recently, I found myself asking why ebooks haven’t really taken off as a medium. Certainly more recent efforts, such as Amazon’s Kindle, have helped to reignite the market after a rather dubious development period over the past decade or so, but if one compares the ubiquity of mobile phones or digital audio players, e-books are entirely missing from the landscape. 1According to The Guardian in April 2008, ebooks accounted for less than 1% of the total publishing market, albeit this share has no doubt increased since. In purely utilitarian terms, should the technology ever be fully and appropriately used, ebooks have a lot to offer over their paper counterparts. There are far fewer requirements and resources needed for production, and distribution is much easier. Whilst a device on which to read ebooks might outweigh a single volume, additional books add nothing, and in terms of transporting books en mass, ebooks are clearly in favour. The ability to flick through a paper volume might be lost in the electronic form, but this is clearly compensated for by vastly improved tools for search and cross-referencing. Likewise combining other forms of media such as video and audio is a perfectly reasonable conception with ebooks, that the paper variety can’t really compete with on any level. They’re also more easily manipulable, in terms of being able to zoom, highlight or simple leave your own annotations about the place. All of which is to say nothing of the potential advantages for newspapers and other periodicals. Yet although the technology is certainly in a position to deliver an entirely new experience for readers, the potential has not really been tapped to any great extent, and in fact it would appear as though it is being deliberately held back. Tempting as the current technology may appear, there are still many questions left unanswered that prevent any real rapid transfer. Can books somehow be backed up to prevent possible corruption? What happens to the titles previously bought should one buy a different reader? When buying a paper book, customers can feel confident that their purchase is physically in their position, to use as they see fit. Even simple, everyday acts that we would normally take for granted with a paper book, 2Though with the potential to infringe upon copyright laws. 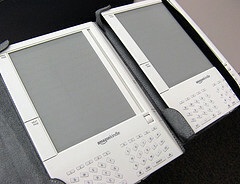 such as photocopying pages or lending it to a friend, suddenly become problematic when dealing with the ebook equivalent. And what about being able to sell a book on when you’re finished with it? In addition, the recent case of Amazon withdrawing books sold for their Kindle reader, 3Pictured above. Image by davidking via Flickr. including deleting the items from user’s devices, highlights yet one more issue that users face when choosing between paper and electronic formats. The current situation reminds me very much of that surrounding the invention and spread of mp3s in the later 1990s. Whilst the format gained in popularity and notoriety in the years following its publication in 1994-5, the music industry treated the news entirely as a threat to its position, and sought to localise and stifle the Internet phenomenon. When one considers that it wasn’t until mid-2003 that today’s largest online music retailer iTunes opened its e-doors, it becomes clear just how difficult working against such conservative forces can be. It’s an interesting phenomenon, given that most technological advances are met with very early attempts to capitalise upon them, that such an opportunity went virtually ignored and even shunned for almost a decade, before a success story could be made out of it. Perhaps all that is needed to really revolutionise the world of publishing is that mp3 format of ebooks, a format that will provide readers both the security of ownership that a regular paper equivalent manifests, combined with every advantage today’s technology can provide. That format for books has nothing to do with size and ease of distribution, as it did with music, rather a format that will open up a digital format to all publishers, and make the rather fledgling e-publishing market explode. 1. ↑ According to The Guardian in April 2008, ebooks accounted for less than 1% of the total publishing market, albeit this share has no doubt increased since. 2. ↑ Though with the potential to infringe upon copyright laws. 3. ↑ Pictured above. Image by davidking via Flickr.